We have ultralight aircraft for sale including ultralight airplanes, helicopters, amphibious ultralights, power gliders and gliders as well as many other ultralight planes. Naturally there are two types of aircraft for sale i.e. new and used. First of all we will promote new ultralight aircraft. If you are searching for used ultralights click here to be taken further down this page. If you have an ultralight airplane for sale and would like to add it to this website, click here. The new and used ultralight aircraft you will find here include airplanes, helicopters as well as gyro copters, gliders and motor gliders, powered parachutes or aerochutes, paragliders and amphibious ultralights. We have a highly recommended list of new ultralights for sale. My research has been extensive and thorough and I have only agreed to list quality aircraft. 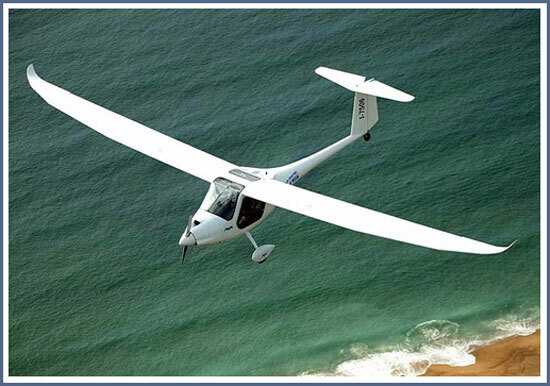 Allow me to introduce to you an award winning Motor-Glider ultralight aircraft. Characteristics: Fitted with a Rotax 912, 4 cylinder, 4 stroke, 80hp engine which provides a cruise speed of up to 115 knots (213km/h or 133mph). Fuel consumption is 11.8 lph flying at 110 knots which will provide up to 7.5 hours flying time. Wingspan is 49' 1.5" (14.9m) and are fitted with air brakes to improve shorter landing distances. The wings are also equipped with positive and negative flaperons (a combination of ailerons and flaps). It is built using hi-tech epoxy resin, fibreglass, carbon and kevlar composites. As this aircraft is a motor-glider you fly powered or unpowered (gliding) throughout your flight/s. The glide ratio is a remarkable 30:1 although reports of better than 40:1 are being reported by owners. You choose between a nose wheel or a tail wheel. This aircraft has won so many awards under many different categories. It flies on every continent in flight schools, national aviation associations and/or within the military to instruct and train pilots. A little history about the company that manufactures these amazing ultralight aircraft and others as well. The company was established in 1987 and due to government restrictions were only able to test their aircraft at night as flying ultralights was illegal. The flying times and shape of the wings helped the aircraft earn the nickname - "bats". We are constantly getting requests from keen ultralight pilots for various used ultralight aircraft for sale. Therefore if you have a used ultralight aircraft that you would like to sell, just complete the form below. We will list your ultralight aircraft for you and hopefully attract a buyer on your behalf. I have a used ultralight aircraft that I would like to sell. Below are all of the details you will need to know. If you would like to know more about this ultralight please reply in the "Comments" section below. Just provide all of the details that pilots are going to need to know, right here. Click on any of the used Ultralight Aircraft below that you would like to receive more information about. Now that you have looked at ultralight aircraft for sale, it is also a wise idea to consider ultralight aircraft insurance. We are able to obtain free insurance quotes online. Why not at least get an idea now at what your monthly and/or annual insurance premium would be once you have purchased your ultralight. Click the link below to obtain your free quote.